Set in a London comprehensive school, Grange Hill was first broadcast on 8 February 1978. Although initially conceived as a nine-part series, the programme proved to be so popular that it carried on until 2008. It also earned a reputation for its realism and willingness to tackle difficult subjects – from bullying and truancy to drug use and teenage pregnancy – which also meant that it soon became a source of public controversy. In part because it was a children’s programme, and partly because of its affinities with ‘soap opera’, the programme has earned relatively little serious academic attention. At the same time, it is still fondly remembered by those who grew up watching it and maintains a loyal following online via fansites such as Grange Hill Gold and Grange Hill Online. The fortieth anniversary of the programme therefore offered the opportunity to organise an event that brought together some of those responsible for making the programme with those who have enjoyed watching it and those involved in researching and writing about television history. To this end, the Centre for the History of Television Culture and Production at Royal Holloway, University of London, teamed up with the classic TV organisation Kaleidoscope and the Good Grief Trust (a charity run by the former Grange Hill actress Linda Magistris) to run a day of screenings, interviews, presentations and discussion. These involved the programme’s original Executive Producer, Anna Home, the programme’s creator and original writer, Phil Redmond , the composer of the show’s musical theme tune Alan Hawkshaw, members of the show’s cast (George Armstrong, Mark Baxter, Joanne Boakes, Lisa Skeates, Paul McCarthy, Paula Ann Bland, Lucinda Curtis and Gwyneth Powell) and television scholars Helen Wheatley and Rachel Moseley from the University of Warwick and Maire Messenger Davies from the University of Ulster. Anna Home, who originally commissioned Grange Hill and initially acted as the programme’s Executive Producer, began the day by discussing the situation of the BBC’s Children’s Department in the 1970s, the changing social climate and the desire on the part of the department to appear less ‘safe’ and ‘middle class’. This encouraged a desire to move away from fantasy by commissioning a contemporary drama of school life. She went on to discuss the reception of the programme, particularly of the second series (which famously included the activities of the Students’ Action Group), noting the way in which the programme was welcomed by its audience (of children) but fell prey to attacks from parents, teachers and politicians. She also argued that the programme had created a ‘knock-on effect’ for children’s drama, encouraging it to become bolder and ‘braver’ even if Grange Hill itself could be said to have become tamer as the years went by. The programme was, of course, primarily the creation of Phil Redmond who was interviewed by the Chair of the Writer’s Union, Gail Renard, with whom he had worked on the ITV series The Kids from 47A as a writer prior to Grange Hill. In an engaging conversation, he explained how his ideas for a school drama coincided with those of Anna and how he had sought to write a drama that reflected the lives of ordinary kids growing up. He acknowledged his commitment to producing work that was socially-conscious and realistic but also rejected many of the criticisms of the show (including allegations of ‘bad language’ and ‘Marxist subversion’). Despite his social and political allegiences, he also revealed his astute business sense in retaining the rights to the programme and subsequent development of Brookside for Channel 4 in which his strategy of employing the ‘soap opera’ format to address contemporary social realities was continued. Insights of a different sort were provided by Alan Hawkshaw who explained how he had worked as both a studio musician and composer of library music. What became the theme tune of Grange Hill was not, therefore, a special commission but a piece, originally entitled ‘Chicken Man’, which he had previously recorded for Thames (and which also became, in a slightly different version, the theme of the quiz show Give Us a Clue). He also explained how the theme music for Countdown, Channel 4’s long-running game show, began life as one of his library recordings as well. The panels involving actors also provided informative accounts of the backgrounds of those involved, how they came to be involved in the programme and their experiences on set and in Television Centre. The interviewees reflected upon their ‘in-between’ status as child actors as well as the challenges of coping with the level of attention it brought them. Although some of the cast went on to enjoy adult acting careers many didn’t and the discussion of how the experience of acting in Grange Hill impacted upon their later lives raised a number of issues about both the pleasures and pitfalls of becoming ‘stars’ at a youthful age. This was not, of course, true of ‘the teachers’ who were represented at the event by the well-established actors Gwyneth Powell and Lucinda Curtis who discussed their involvement in the programme, the challenges of working with child actors and the influence that Grange Hill had had upon them. The final session of the day involved a consideration of the significance of Grange Hill in terms of television history more generally. Helen Wheatley argued that children’s television had been insufficiently studied, partly on the grounds that it was considered neither sufficiently serious nor substantial enough to merit sustained critical attention. Rachel Moseley, however, also argued that the programme possessed a particular importance for the teenager whom she suggested had not previously been offered this kind of drama (and whom Phil Redmond continued to address with the Southern Television production Going Out in 1981). Maire Messenger Davies discussed the ‘ebb and flow’ of the drama and considered how the programme’s serial format, use of multiple characters from diverse backgrounds (who were refreshed annually) and treatment of contemporary issues allowed the programme to continue to generate new story-lines and maintain audience loyalty. Both she and Rachel indicated how the programme fulfilled the Reithian mission of informing, educating and entertaining, without resort to didacticism, despite the criticisms that were directed at it. Messenger Davies paid particular attention to two ‘telling examples’ of how the programme worked: the Students’ Action Group sit-in, partly led by Jessica Samuels in Series 2 in early 1979, and the death of Danny Kendall in Series 12 in 1989. She indicated how the Danny Kendall memorial scene, and other material from Grange Hill, had been shown to MPs in the run-up to the 1990 Broadcasting Act as an example of the value of children’s programming and the need for it to be protected. She also indicated the empowering aspects of Samuels’ role in the student protests even though it was scenes such as these that had led to criticisms of the programme (for its encouragement of ‘bad behaviour’ and attacks on authority). While Grange Hill was generally much less radical than its critics claimed, the programme did, nonetheless, succeed in offering a degree of commentary on the times in which it was made. As the panellists noted, the election of the Conservatives, under Margaret Thatcher’s leadership, in 1979 helped to invest later story-lines with elements of political allegory with Gwyneth Powell, who took on the role of school headmistress in 1980, admitting that her character was sometimes compared to Mrs Thatcher. The day ended with questions and comments from the audience. The event itself was unusual (for a university) in attracting far more fans and enthusiasts than academics. Those attending spoke of what the programme had meant to them and the affection with which it was still held, recalling their favourite characters, episodes and incidents. Although the event was partly held under the auspices of the ‘Forgotten Television Drama’ project, undertaken at Royal Holloway, it was evident that, while the programme might have suffered neglect at the hands of television scholars, it lives on in the memory of those who grew up with it and whose childhoods were shaped by it. This not only underlined the importance of the programme historically, testifying to some of the impact that it had upon audiences at the time, but also suggested some of the ways in which we might think about the (enduring) appeal of drama aimed at children and teenagers. 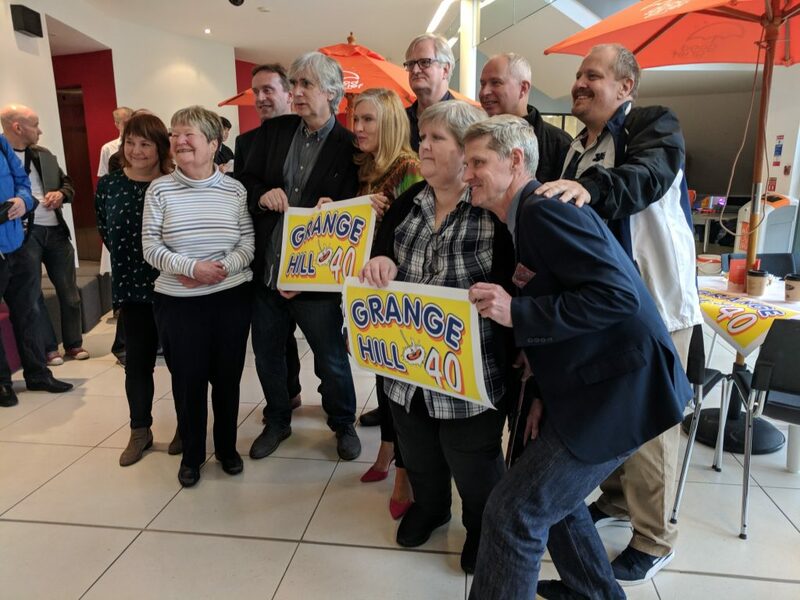 By bringing programme makers, television historians and fans together to discuss the programme in this way, the event marked the 40th anniversary of Grange Hill in a slightly unusual but nonetheless highly enjoyable and instructive manner.